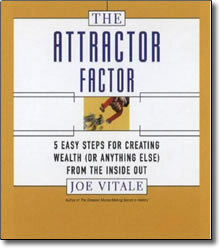 The Attractor Factor by Joe Vitale – CD or MP3 download – Discount! Success of any kind doesn’t depend on what you’re doing, it depends on what you’re being! Internet marketing pioneer, Joe Vitale combines time-honored practices of spiritual self-discovery with proven marketing principles into an extraordinary how-to manual for happy living both in and out of business. With quiet humor and tender encouragement, Vitale shows you how easy it is to let yourself love, heal, prosper, and grow. After sharing his own quest for wealth and success, as well as stories from people he has guided to inner piece and out affluence, Vitale helps you determine your Prosperity IQ, and then leads you gently through the 5 simple steps that will make all your aspirations a reality. Joe shows you how to find the springboard that will help you rise above the negativity that surrounds you and lift yourself into the realm of miracles. You’ll learn how to dare something worthy and how to seek and uncover the missing secret to your own personal happiness. And you’ll discover how to look at your life goals, and those of others, in a new, positive, and energizing way. When you reach step five, you’ll be ready to receive and understand The Ultimate Secret—the state of being in which the universe quickly brings you together with the things that you desire most. Whether you yearn for wealth, love, prestige, great accomplishments or all of the above, they are already yours, and they always have been. They are your birthright. listen to The Attractor Factor and reunite yourself with your legacy.